A video showing a teacher giving a lesson while pulling an intravenous drip around the classroom has touched the hearts of Chinese netizens. 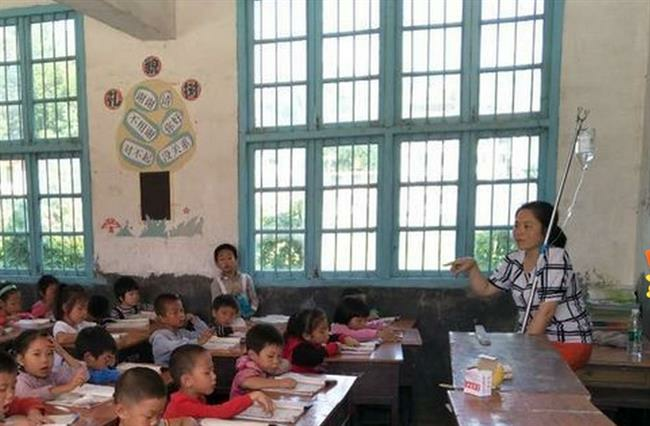 Zheng Shihua, a grade one teacher at a primary school in Xinhua, Hunan Province felt dizziness and vomited when she got up on the morning of September 15. She immediately headed to a local health center and asked for leave when she bumped into the principal on the way. Later, two parents visited her at the health center and told her that although the school had arranged a substitute to give classes, the naughty children were not very obedient. Zheng rushed to the classroom when she felt a bit better, having been on a drip for a while. Video of the devoted teacher holding a class while sick and still attached to the drip was captured by a parent and soon became a hit on social media. Chinese netizens applauded Zheng for her strong sense of responsibility and high level of dedication. One web user said, "What a good teacher! The pupils in her class are lucky to have such a selfless teacher."